Imagine the following scenarios, you have been hired by a company and assigned to be an ISA Server administrator, you do not know if this ISA Server is licensed or in trial mode !! Another scenario is, you have installed ISA Server 2006 Trial version, its been quite long time and you do not know when the trial version will expire, what should you do ? In this article, I will show you how to identify a trail version of ISA Server 2006 and how to know when the Trial Version will expire. 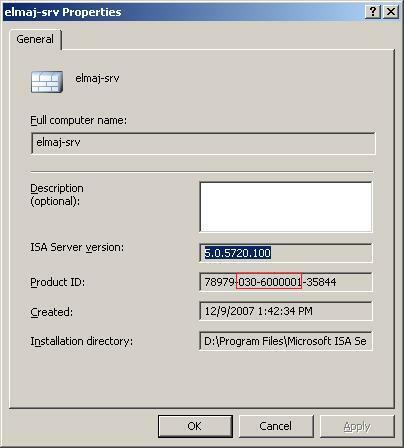 I have installed multiple Trial versions of ISA Server 2006, and from all these trial versions, i have noticed that you can identify your version of ISA Server if it is trial or not using the Product ID, if your ISA Server Product ID has thexxxxx-030-6000001-xxxxx format, then it is a Trial Version. add 180 days to the date listed inside the Created Textbox and you will know when your ISA Server Trial version will expire. In this article, I showed you how to identify ISA Server 2006 if it is in Trial Mode, and how to know how many days are still remaining before the Trial period, which is the 180 days period will expire.